My family loves loves sports movies – like Rudy and Hoosiers. They are the type we watch over and over again. 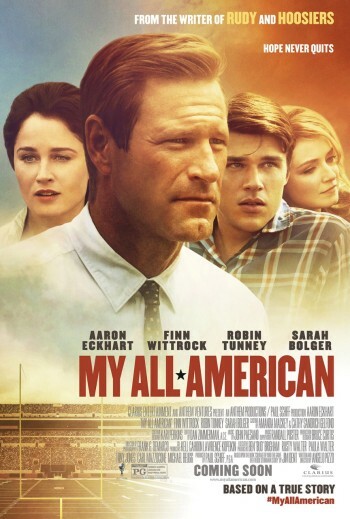 My All American is a family friendly football flick (say that fast!) rated PG by the same writer as those two favorites. It opens in theaters on November 13th. Visit All My American for more info. Does your family like football flicks? WIN $25 Visa Card + My All American Swag! My All American Long Sleeve T-shirt, Hat & Cinch Sack. If you have won the same prize on another blog, you will not be eligible to win it again. This giveaway will end on November 11, 2015 at midnight EST. Winners will be drawn via rafflecopter. Once a winner is drawn I will contact them and they will have 48 hours to reply before I draw a new winner. Giveaway is open to anyone US and you must be 18 years of age or older. Giveaway not affiliated with Facebook & I release them of liability. Winner will be posted in the rafflecopter widget. Gluten-Free, Value Meal Deals, & More at Chuck E Cheese Giveaway! $10 Amazon ~ 3 Days Only ~ Giveaway! We enjoy watching our favorite College and NFL sports football teams and rooting for them. We are also watching the World Series. Some of my family members enjoy sports movies but not all! I think my brother would really enjoy the movie! I don't necessarily seek out sports movies, but I do love feel-good movies, wholesome movies. And I thoroughly enjoy Aaron Eckart! I don't watch a lot of sports movies but I loved the Blind Side! Yes, we were big fans of RUDY and HOOSIERS. Yes, my family loves movies about sports. My family loves sports movies, as well as live sports games. Thanks for the giveaway. University of Texas! My daughter will be graduating from UT in May...then grad school there. Hook 'em Horns! Yes, we all like sport themed movies. Sounds like a great movie about over-coming challenges. My family loves watching sports movies. They're always inspirational. I enjoy any good movie, I liked facing the giants, so I think I would like this & my hubby likes football so I think it would be a winner. My family LOVES sports movies! All of us...boys and girls! This movie is definitely one we look forward to seeing as a family! We love sports movies. This one looks like it will be a good one. My family as a rule LOVES any movie I can get my paws on! We think sports movies are definitely enjoyable! We love sports movies - especially my dad and I! My guys like movie swag especially t-shirts. Makes them want to see the movie more. Yes we enjoy sports movies. We all love a good sports movie! I have two boys and they love sport movies. My family loves to watch sports movies! We enjoy going to the movies together and seeing wholesome movies that have a good message. We would certainly love this one! My adult son and I love sport movies.. In fact this weekend we are going to see Woodlawn! This looks like a good movie, my family would enjoy it. We watch some sports movies. We like sports movies. McFarland was wonderful! (My daughter is a cross country runner). Oh yeah they are great? I love sports movies! My boys always watch them with me. I wish that Netflix would add more lol..I've watched all that they have. We love sports movies love to see this one. We do enjoy inspirational sports movies. One of our favorites was "Miracle" about the US Hockey team winning. I think this is a movie hubby would enjoy - not too sure dd would! We do! Remember The Titans is one of our favorites. I enjoy sports movies, especially when they are based on true stories! Sports movies are good for the family. There are some classic sports movies that our family loves, like The Natural and The Blind Side. Yes, my family liked sports movies. My family enjoys all sorts of movies. When we go camping once a month, we tend to watch lots of movies at night. I earned a graduate degree from the University of Texas at Austin and have been to the stadium named after Darrell K. Royal. Go Longhorns! This will be a fun movie for our family to watch. We do like sports films especially the uplifting ones. thank you!! This looks like a movie my family would enjoy. We do like sports themed movies. Thank you! I love sports movies! They are so inspiring! Yes, we like sports movies. They are always so inspirational. We've watched a few good sports based movies over the years. I like some sports movies. Rudy was really a good one. I have two boys so we watch sports movies all the time! Our family does indeed enjoy sports flicks. We enjoy all types of movies! My family enjoys movies of all kinds, including sports movies. We love sports movies, especially if it is a true story! yes, we love sports movies! Yes, we enjoy sports movies :) Remember the Titans. Friday Night Lights. We like a big variety of different movies and this one looks like it will be pretty good. My family LOVES sports movies. Our favorite it Remember the Titans. Yes my family loves sports movies, we are excited for this one. My son loves sports movies. meh the boys and men here like them but I can pass. I read more than watch movies. But I do love sci fis and some oddball movies when I do watch them. LOL Like I'm going to go to Star Wars when it comes out. As long as a movie is good, genre doesn't matter. We love sports movies. Our all time favorite is Hoosiers. We love all kinds of sports movies! Our family does enjoy sports movies. I love watching sports movies with my family. Oh, yes! My family always has 'The Sandlot' and 'A League of their Own' on standby! My husband has converted are oldest daughter into a lover of all things sports just like him. Yes, my husband loves sports so we watch sports movies all the time. My son enjoys sports movies. We do like some sports movies, but it depends on the sport, and the actors who are in them. Thanks for the giveaway!! My family enjoys some sports movies. We especially like ones that are biographical. My boys just love sports movies. There their favorite. Sometimes, depends on the quality of the movie. We do enjoy sports movies. Some more than others but we end up watching a lot of football or baseball related movies. There are some sports movies that I have really liked, so I would say yes we do enjoy them. Our family enjoy sports movies all the time. Yes, we love sports movies!! Loved Facing the Giants! We enjoy sport movies especially football and Olympics. We all love sports movies like this. Most of the family has played sports, or still do. We have sports fans here so we like sports movies. My husband enjoys sports movies very much. We love sports movies! I especially love "Remember the Titans". Yes, my family loves sports movies! I don't much care for sports, but I do like sports Movies. They are usually very inspiring. Rudy is one of my favorite movies. We don't watch a lot of sports movies, but the ones we have watched we have enjoyed. family defintly loves sports and movies ! My nephew would get a kick out of this movie. Thanks for the contest. There are a few sports movies we like, but only a few. My husband likes sports movies. We do love sports movies!! We love sports movies! I love Rudy which is another movie of these writers! I have 2 sons and a hubby who love sports movies! My boys grew up watching sports movies and they still watch them. Yes we like them from time to time, this sounds great! My husband and teen sons enjoy sports movies more than I do, but they are okay. we are a huge sports family, so we definitely love to watch movies about sports! I also love that even if you don't play that sport, these types of movies usually have great lessons in them, whether you play or just watch! My boys and I love stuff we can watch together. This would be a perfect family movie night movie. Yes, we love sports movies. We watch a lot of movies. The hubby and the son really enjoy watching those type of movies together. We love sports movies !! Oh we love watching the sport movies! I do love these kinds of movies. Yes, my family does usually enjoy sports movies! My family loves sports movies! Oh yes, we LOVE sports movies! We're not huge fa b s if sports movies, but we do love heartwarming films where people overcome huge obstacles. This sounds very good with a great cast. We'd watch it. Not a big sports family....but the movies are good! Yes, we do enjoy watching sports movies together. This one looks like one we would watch! My husband is a huge sports fan! We love watching this type of movies. Sometimes ,But yes we like them. I have 3 sons and 2 grandsons. It's all about sports in my house and we love sports movies. I like sport movies with a message. Like Field of Dreams and League of Thier Own. Yes we like sports movies. We loved Hoosiers and we liked Rudy. So I know we will love this movie also. We do enjoy sports movies, in particular the inspirational ones. We really haven't watched much sports movies and have been more into animal planted, discovery channel, history channel and things like that. We do love sports though and our boys play them. Yes, we like sports movies. My family is a very big sports family and we always enjoy watching sports movies. My family are movie nuts!! My husband and son like them much more than I do, but I'll watch them as a family so we can spend some great time together. We do love sports movies, our favorite is Major League: Back to the Minors. My entire family loves sports movies, particularly football movies as we live in a popular college sports town. We like sports movies from Necessary Roughness to Remember the Titans to Rudy, all very good. Yes, we do often go to sports themed movies and enjoy them. We do enjoy movies of all types, but especially sports movies. There are some sports movies that we have enjoyed very much as a family. My family enjoys all types of movies. We love sports movies. There is always action, a little comedy and usually something sad but that is how sports is for fans and/or players! I love sports movies I always end up cheering and it's funny because they cant hear you! If we hear they are good...but don't necessarily seek them out. We don't usually watch that many sports movies, but I do find the stories inspiring! Yes, we love sports movies. No, we're not really into sports movies. Rudy is one of our favorite sports movies too! Thanks you!! I enjoy sports movies especially if they are true stories. I think they are inspirational. Our family loves sports movies – I think they are full of emotion. Yes, our family enjoys sports movies. My dad and brother sure do, my mom not so much lol. Yes, we love inspirational sports movies. There are many sports movies that I have liked to watch. I watch movies with my grandchildren. I love sports movies. Especially underdog stories. Thank You for the giveaway…this should be a good one: screenplay written by guy who wrote "Rudy" & "Hoosiers". I love football! It really stresses me out as well though. We like all kinds of movies! My hubby loves sports movies and I watch to make him happy. lol!! I like that many of the sports movies we have seen are uplifting and "clean" though. Yes, we do enjoy sports movies. My favorite is The Blind Side.